cannot find controller configurator in VR or desktop modes. please advice me on what to do , thanks. To help me troubleshoot, could you first tell me if you have a Steam controller connected and powered? You won't see that option otherwise. @sutekiB , Thanks for replying , I did not know a steam controller is required, I dont think it was mentioned in the PDF , I do have one , sadly it is in my other home in another country ! the amount of tinkering that is required to run a game on the omni is really INSANE ! I think Virtuix spent too much time perfecting the packaging , the manuals , the product .. but totally forgot about game support ! and 100% forgot about oculus rift and touch... having to turn cameras away before lunching a game and then turning them back on is just redicilous , there has to be a better way to start games with an oculus rift.
. having to turn cameras away before lunching a game and then turning them back on is just redicilous , there has to be a better way to start games with an oculus rift. WHAT????? are you kidding? you have to do this every single time? Hi @sami, I'm sorry you don't have access to your Steam controller, I am a fan of that peripheral. Although it's not required - you can also use an Xbox controller! Indeed an Xpadder profile is provided along with the guide. GTAV does require more tinkering that some other legacy games I'm afraid. The guide is one of my older ones, and contains some details that I've since taken to separating into an 'advanced' companion guide - making the basic guide less daunting. The list of controls are also spread out rather confusingly, whereas later guides have them all in a table at the end. BTW, the easiest games to set up are Vive mods, as they don't usually require VorpX, and they often use the Vive controllers (so no need for Xpadder or loading Steam controller profiles). I would definitely look into buying a Vive if you want to get the most out of your Omni. Regarding content, you are right this is a challenge. The Rift was originally designed for seated gameplay, and has tracking issues when played in a 360 degree format. The Vive has a more advanced tracking system and is better suited to 360 play. However, on their own they are both limited to certain game types due to artificial locomotion induced simulator sickness. Naturally, they have each been working with developers to produce content that can be played comfortably with just their system. This places a large burden on Virtuix - a much smaller company than either Facebook or HTC, to support developers who want to make content for the Omni. Fortunately, there is a lot of interest as many people dislike the over-reliance on teleportation mechanics, and are looking for a change from wave shooters and cockpit games. Indeed, games that support the Omni offer compelling reasons to try new content, as they give you a valuable extra dimension to explore without boundaries. I've played a couple of the upcoming games that use the Omni's SDK, and I can tell you they're amazing! I hope to upload a video of one of them soon. I dont do it my self , but this is what virtuix wants you and tells you to do , not sure when I saw it , but I saw a video about that uploaded by virtuix on youtube. they say it will minimze head tracking problems if you do so. I got kind of dissappointed after trying VorpX , I bought it thinking that it will fix everything , but the amount of settings you need to adjust for each game is really alot ! I guess I will stick with Vive mods for now , do you know any other vive mods , other than doom BFG ? can you write a list please. I cannot wait for more Omni SDK games , looking forward to see those videos ! I hope they will support touch controllers from the start this time. Yes, there is an awesome Minecraft Vive mod, which I have a guide for. Dont mind the the hand motions , but this game is a little outdated if you ask me , it looks like its running very well from what I see , but I prefer to play something that would utilize my PC Power to the max. I bookmarked the thread and I will keep an eye on it for sure ! I just wish if you can give us a very detailed step by step guide for each game , or vorpx profile for each game and perhaps xpadder profiles. It would save me and many others alot of time. Am really bad at setting up the games ! I wish I could pay you to come over and set up everything for me as clearly you are a pro at this ! ( knock on wood ). Unfortunately VorpX is a necessary evil at this point. I dislike the program to no end as it is cumbersome and difficult to find a happy medium/compromise. However, AAA legacy titles utilizing Virtuix's keyboard compatibility are some of the greatest experiences available. With all the shortcoming, cursing, and frustration, once you get GTA V to work properly in VR with Omni, your jaw hits the floor, it is that incredible I assure you. I encourage you to stick with it and ask questions. I know I am more than willing to trouble shoot and help you wherever I can, and I am sure dozens of others are too. We all joined this for the same reason, and community inviolvement is most of the fun. is there a link for this pdf thanks! sorry update, and shameless bump. Read every thread on all topic pages, getting little clues here and there.. but nothing in the end to configure this. It seems the main problem is getting the game in this case to turn the player when the Omni ring turns, and to then walk in the direction the ring has turned in the game, as it is right now the ring does not do anything in GTA V. Meaning walking for example in the 9 position does not result in moving in that direction, the character is sill walking in the 12 position. The only solution is to move the mouse to redirect the game so that walking in 12 position is correct. I read earlier in this post about attaching a Vive controller to the harness/ring so that the Vive makes the player turn with the ring. But I have not seen the player turn with the controller. I have the Omni set for head independant to body. Maybe that is a problem? But that is the most realistic setting would think.. In a perfect world we should be able to map the Omni Walking sensors X and Y axis to game controller joystick 1, and the Omni ring to joystick 2 or Z axis or Mouse Left and Right as most games like flight simulators control yaw with Z, or left and right turning with mouse (about every game ever played), or left and right turning with joystick 2 (GTA V). This should be easy. Since 1991 I have owned; Thrustmaster Cougar Hotas, CH Products flightsticks, Various rudder pedals, Microsoft joysticks, Game Pads including XBox Elite, Various Speed pads, heck even Track IR 4 Headtracker was mapable like that but Omni it seems not. This is pretty 101 stuff to get an axis to map is my point. or is it more than that like, when the ring turns 90 degree to the left the joystick left now needs to be player forward?? Boggle!! So it would be something like when right joystick is pushed left, left joystick to left is player forward. This would in a sense index the movement of the player on the Omni correctly?... Sorry more i think on this the more confusing it gets. 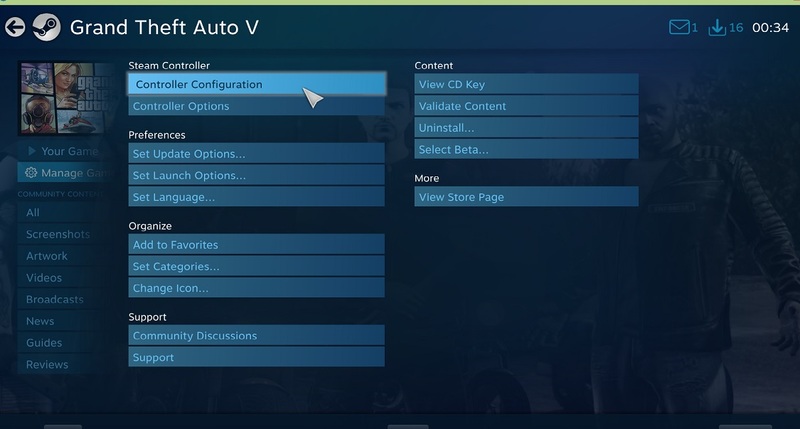 -	configure games controllers in steam.. configure how? -	use Xpadder.. ok how and how about a profile for it..
-	strap one Vive controller to the harness? okay…. -	use SDK? where how..
-	Room scale mode or sitting mode for Vive? Thanks for help in advance I am stuck on getting this to work!!! Got hold of the guide thanks! It helps but still not there yet. I set up Xpadder, what is the point of using that it maps the game controller but we are using the Omni, so why map the game controller? or do I map the profile of the game controller to the Omni? Will the player turn with the Omni? 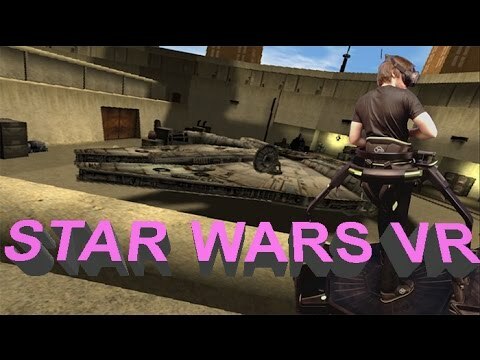 Do I need GTA VR mod? or just Vorpex? Do I enable head tracking and roll in Vorpex?